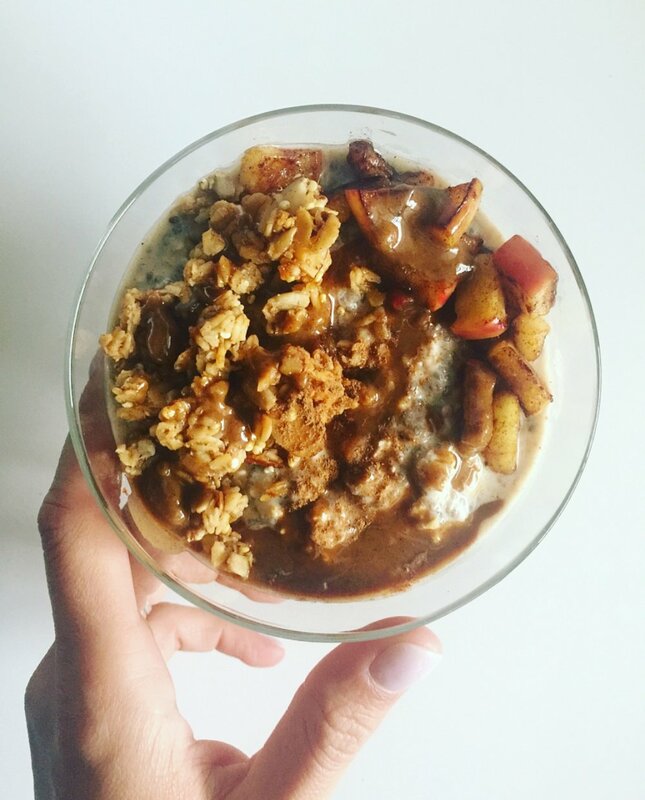 If you're looking for an easy, nutrient-dense, TASTY breakfast option, I've got two words for you: OVERNIGHT OATS. These make-ahead oats are life. changing. I mean it. They literally take 2 minutes to throw together and the flavor combinations you can make are endless. I have a few faves of my own, such as Banana Bread Chocolate Chip, Chocolate PB, and Strawberries n' Cream. Now I have another ah-mazical combo to add to the list: APPLE PIE. I know, you're probably salivating already, so I'll get right to it. Add the first list of ingredients into a mason jar (or sealable container) and shake/stir till well combined. Let sit, covered, in the fridge overnight (or at least 4 hours). When you're ready to eat them, stir in the collagen peptides and top with the rest of the ingredients. If you want to get a bit fancy (and have the time), you can quickly saute the diced apples in a little ghee (or cooking spray) with cinnamon. That just adds even more of an apple-pie feel. These are usually served cold, but you're welcome to warm the oats for a few minutes if you'd like. I also enjoy eating them wearing leggings and boots while sipping on a homemade pumpkin spice almond milk latte. Yes, I know, I'm as basic as they come.